1. 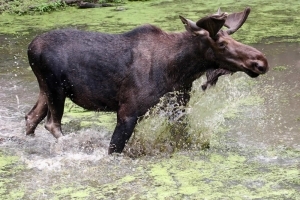 Where and when are moose at highest risk from predation? Wolves are the major predator of white-tailed deer and moose in Minnesota. They have been hunting moose for thousands of years and they are an important part of the ecosystem. 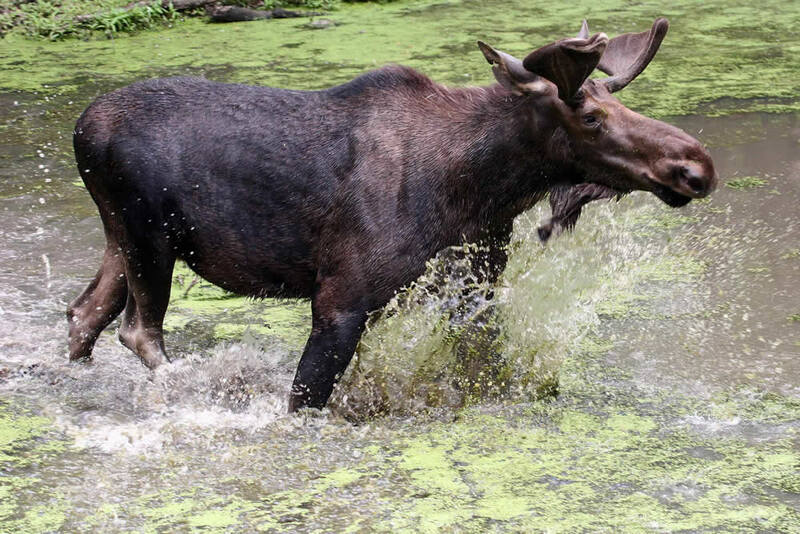 As scientists seek to understand the moose decline in Minnesota, it is important to study all major sources of moose mortality – including predation. 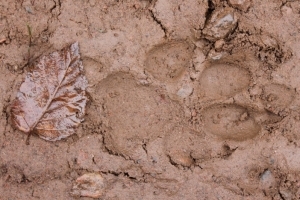 Wolf track in the mud, found in northeastern Minnesota. 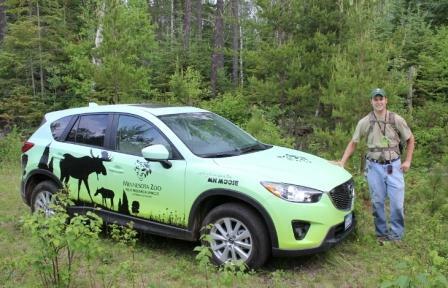 Dr. Brian Kot, a recent post-doctoral research scientist at the Minnesota Zoo, compared how and where wolves and moose spend their time in three different areas of northern Minnesota. These areas are interesting to study because their forests and wildlife are managed in different ways. Brian used data from GPS tracking collars to monitor the movements of moose and wolves and compared how they use their habitat. Dr. Mark Ditmer, the current post-doctoral research scientist at the Minnesota Zoo, is continuing data analysis of this work. This information will be used to map where and when moose are most likely to encounter wolves, and thus where they may be at highest risk of predation. 2. Where are moose most likely to pick up parasites from white-tailed deer? White-tailed deer carry parasites that do not hurt the deer, but that can cause illness or death in moose. Parasites, such as brainworm and liver fluke, that are shared between deer and moose may be another reason moose numbers are declining in Minnesota. Deer wearing a GPS tracking collar. Dr. Kim VanderWaal, a recent post-doctoral researcher at the Minnesota Zoo, studied this issue. She mapped areas of northeastern Minnesota that are the biggest risk to moose – areas where they can more easily pick up parasites from deer. Kim wanted to find out why the deer in some areas have more of these parasites than in other areas. 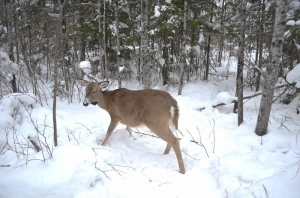 As part of her research, Kim and others fit GPS tracking collars on white-tailed deer. These collars will show where deer are moving in relation to moose. This information will help us understand how much moose and deer share the same habitat. 3. Where do moose go when it is hot outside? Moose are adapted to the cold, so they do not endure hot temperatures very well. Warming temperatures in northern Minnesota may be one reason moose numbers are declining. Learning where moose go when it is hot outside will help us know what type of habitat they need to survive. Moose in the water at the Minnesota Zoo. Dr. Nick McCann, a recent post-doctoral researcher at the Minnesota Zoo, was tasked with studying this issue. Our research partners placed tracking collars on moose in northeastern Minnesota and Voyageurs National Park to record moose locations. Nick studied where the moose went during the summer and which habitats they used when the weather was hot or cool. He also studied moose bed sites – areas where moose lay on the ground to eat or rest. Just as we would choose to sit in the shade on a hot day, moose might choose bed sites in certain locations to help them cool down. Nick learned which habitat types are important to moose when it is hot outside. He and others are working to share this information so that people can maintain or create the habitats that moose need to withstand a warming climate. Dr. Mark Ditmer, the current post-doctoral researcher at the Minnesota Zoo, is also examining how moose are affected by temperature and habitat. He looked at how moose alter their behavior among resting, foraging, and traveling using the same GPS data from collared moose in Voyageurs National Park. By examining at what temperatures moose switch behavior from active (foraging or traveling) to resting, and what habitats are more likely to be used for different behaviors, we can understand how moose might be impacted by changes in climate and habitat. 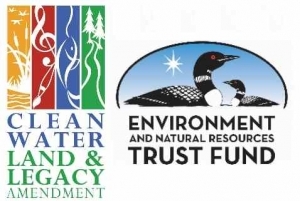 Funding and Other Support The Minnesota Zoo is grateful for the funding and other support it has received for these projects from: Minnesota’s Clean Water, Land, and Legacy Amendment; Minnesota Department of Natural Resources; University of Minnesota Duluth’s Natural Resources Research Institute; Minnesota’s Environmental and Natural Resources Trust Fund; Voyageurs National Park; Grand Portage Indian Reservation; Fon du Lac Band of Lake Superior Chippewa; 1854 Treaty Authority; and Morrie’s Mazda.